Need other IBM Disk Types? The IBM System Storage N Series offers affordable storage expansion.The figure below shows the expansion shelf topology. More detailed information can be found in the Node Setup and IBM Storage Manager Manual located on the documents section on the right sidebar of this page, or in the below expansion table. Orderable disk drives are also available in the sidebars of this page. Contact us if you need more information or integration assistance for your IBM System Storage N Series of products or EXN expansion units. 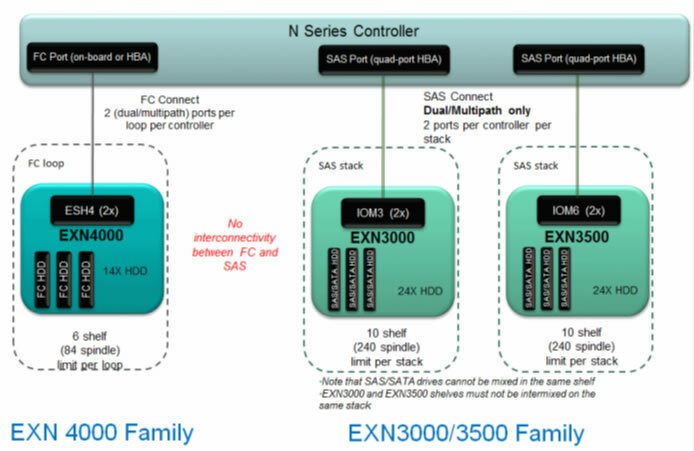 EXN4000 shelves use ESH4 as the controller module. ESH4 is the third-generation, multiloop speed ESH module. ESH4 can function at 1 Gb, 2 Gb, or 4 Gb loop speeds. The ENX4000 can also be added to loops with existing EXN2000 expansion units. The dual-ported FC drives are also interchangeable between the EXN4000, EXN2000, and N3700. 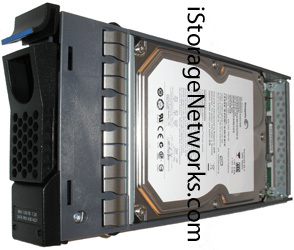 The EXN3000 SAS/SATA expansion unit is designed to provide SAS or SATA disk expansion capability for the IBM System Storage N series systems except the N3300, N3700, N5200, and N5500. The EXN3000 is a 4U disk storage expansion unit. The EXN1000 expansion unit is designed to provide SATA-FC disk expansion capability for the IBM System Storage N series systems. The IBM System Storage EXN1000 can be attached to the IBM System Storage N series appliances, N3700, N5200, and N5500. The EXN3500 is a small form factor (SFF) 2U disk storage expansion unit. The EXN3500 provides low-cost, high-capacity SAS disk storage with slots for 24 hard disk drives for the IBM N series system storage family except theN3300, N3700, N5200, and N5500. "Contact us if you need more information or integration assistance for your IBM System Storage N Series of products or EXN expansion units."